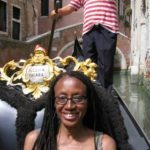 The Mediterranean is one of my favorite destinations, so I was in heaven, or perhaps I should say in a celestial place, when I spent seven days cruising in Greece and Turkey with Celestyal Cruises. I experienced two itineraries, the 3-Day Iconic Aegean cruise on Celestyal Odyssey, which visits four Greek Islands and a port in Turkey and the 4-Day Idyllic Aegean cruise to five Greek islands and one in Turkey, aboard the Celestyal Crystal. The first cruise originated in Athens. I flew into the city the night before, checking into the Athenaeum InterContinental. This 543-room business hotel has a beautiful, modern design, with contemporary art throughout. The rooftop restaurant, Premiere, has views of the Acropolis. For dinner, however, we went to the Hytra Bar located in the Onassis Cultural Centre that also has a view of the Acropolis, which is illuminated at night and helped set the mood for our journey. In the morning our group headed to Port Lavrion to board the Celestyal Odyssey. The Odyssey is the third ship to join the Celestyal Cruises fleet. The 836-passenger vessel was formerly the Olympia Explorer and until last year, as the MV Explorer, was in service as part of University of Virginia Institute for Shipyard Education’s Semester at Sea program. Celestyal cruise ships provide a different experience than one would find on a floating city (like Royal Caribbean ships, for example) or other ships that cater to American cruisers . The focus is on an authentic Greek experience, featuring Greek cuisine and entertainment, with a few typical cruise activities (such as language and dance lessons, karaoke, trivia games and live shows) tossed in. That’s not to say that the ship experience is not enjoyable, but it seems that a major draw of Celestyal Cruises are the incredible ports of call. Celestyal’s Iconic cruises visit historic ancient cities and legendary islands and harbors. We set sail for the first stop: Mykonos. I had a welcome ouzo cocktail in the Aventurine Panoramic lounge, which becomes the disco at night. I had lunch at the Aqua Marine Restaurant. The food was typical cruise fare, but I must admit there is something satisfying about having a Greek salad or Greek yogurt when you’re actually in Greece. Aqua Marine also serves dinner in the evening. There is also the option for buffet lunch and dinner at the Topaz Garden Restaurant and for burgers and other fast food choices, Thalassa Fast Food Corner on the upper deck. 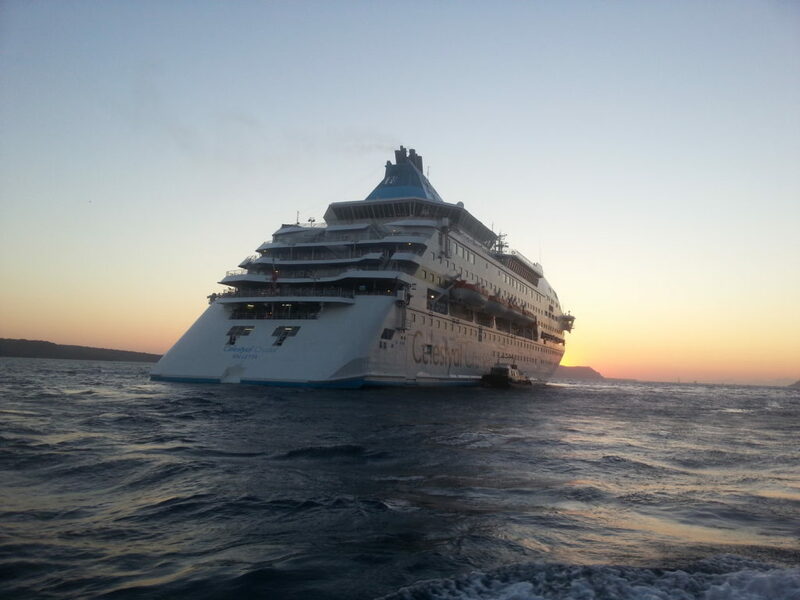 The Odyssey arrived in Mykonos in the early evening. Mykonos is known for its whitewashed buildings and blue domed churches and iconic windmills set upon hills that create charming sunset photos. Some of us strayed away from the guided tour of Chora (also called Mykonos Town) and became lost in the winding streets, not a bad thing, since Mykonos Town is more enjoyable to wander through aimlessly. The maze of streets were so designed to thwart pirates in the 18th and early 19th century. Easily found, though, was the Church of Panagia Paraportiani, or Our Lady of the Side Gate, the most famous and most photographed churches out of Mykonos’ more than 400 churches. 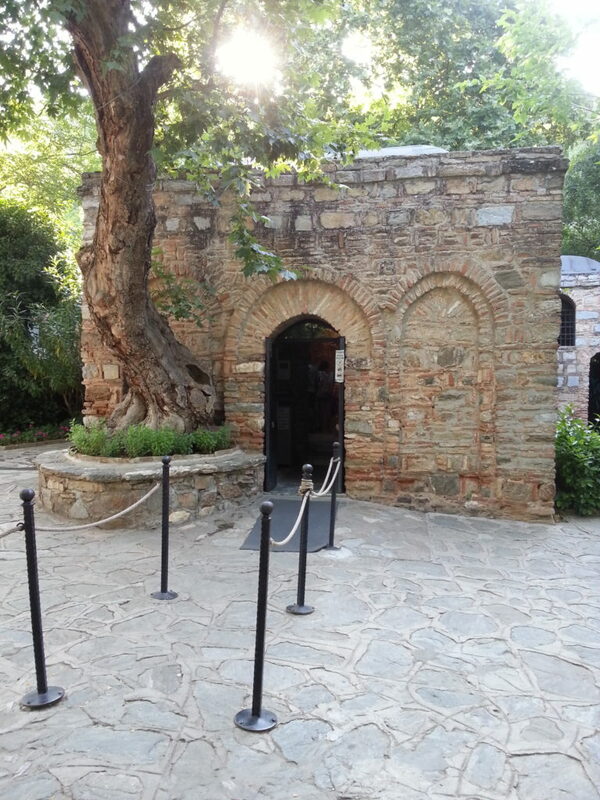 Panagia means “Virgin Mary” and Paraportiani has been translated as meaning “standing next to the entrance door” or “near the side gate,” because the church was located to the side of the entrance of the Kastro neighborhood. It actually consists of five churches molded together and built during various periods. We then walked to the Alefkhandra neighborhood, also known as “Little Venice,” where wooden buildings with colorful balconies line the waterfront. People sit in cafes or on the stone walls to drink Greek coffee or wine, take selfies and watch the sunset beyond the windmills and Aegean sea. I returned to the ship for dinner and then stroll around the decks. Each night there are shows in the Amber Lounge, as well as live music at the Piano Bar Lounge, at the Thalassa Pool Bar and of course, disco in the Panoramic Lounge. In the evening the ship reached Patmos. Called the island of Saint John, Patmos is where the book of the Apocalypse was written and another destination of Christian pilgrimage. We visited the Grotto, where Saint John lived, and the Monastery of St. John which has a museum of icons and rare manuscripts. Then we returned to Skala port. In the 16th century, Skala was an important commercial port in the Mediterranean. It is now a busy harbor with hotels, shops and restaurants. 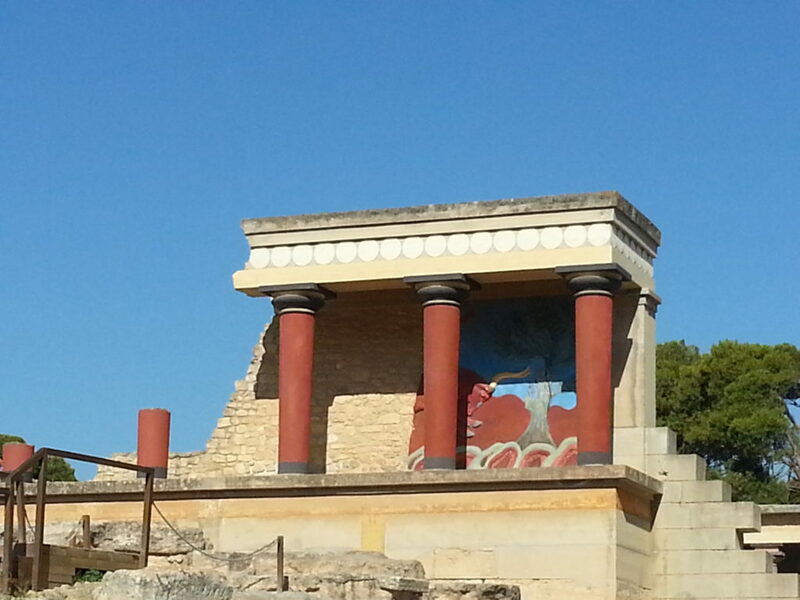 We arrived at the Heraklion port and went on a private tour of Minoan Palace of Knossos. Knossos is an archaeological site in Crete dating back to the Bronze Age. The complex has gone through damage by invasions, earthquakes and the volcanic eruptions of Thera. In 1900 large portions of the palace was excavated and restored. According to Greek mythology it was commissioned by King Minos and designed by craftsman/architect Daedalus. Knossos is also associated with the Labyrinth designed by Daedalus for King Minos of Crete and the legend of Theseus killing the Minotaur. Knossos artifacts can be seen at the Heraklion Museum. Later we arrived in Santorini and took a coach ride to visit Oia Village, along the way seeing gorgeous views of the Aegean Sea. The charming village of Oia has cobblestone streets and the white washed houses with blue doors and shutters, that Santorini islands are known for. Then we returned to Fira (the capital), for a walk along winding, hilly streets, ending with drinks at a restaurant overlooking the water, before taking the Cable Car to the tender boat. On Monday, we are back at the Lavrion port and take a private tour of Ancient Temple of Poseidon. 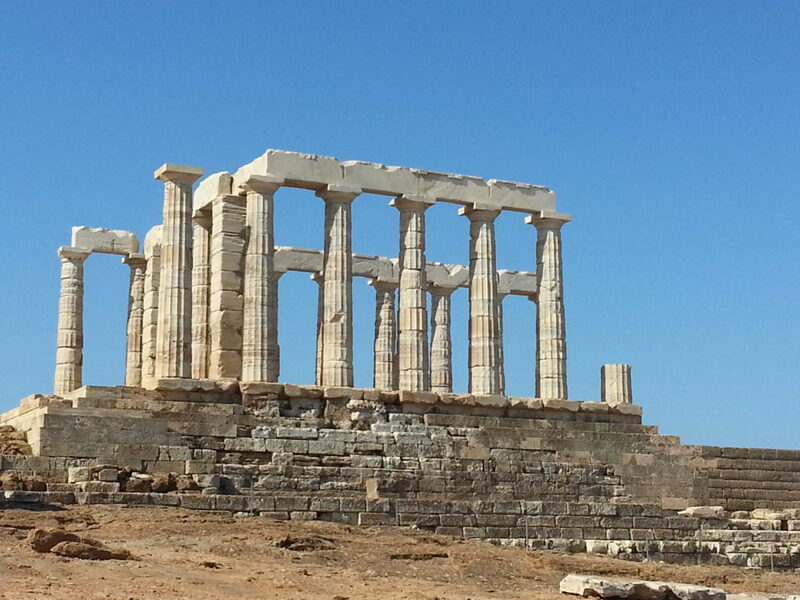 The Temple is located in Cape Sounion, which has been considered a sacred area since the Bronze Age. The Temple of Poseidon is built upon the remains of an earlier temple, the foundations of which are still visible. The Temple was built in the 5th Century BCE at the same time and possibly by the same architect as the Parthenon and Hephaisteion (Temple of Hephaestus, located beneath the Acropolis). A Greek myth tells the story of Aegeus, king of Athens, who upon seeing the black sails of his son Theseus’ ship (which was meant as a signal that his son had been killed in Crete during battle with the Minotaur), leapt to his death in the Aegean Sea. Tragically, Theseus had forgotten to raise the white sails to indicate that he had survived. Returning back to port, we boarded the Celestyal Crystal for the 4-day Idyllic Aegean cruise. It was formerly the Louis Cristal, the ship I was on for my first cruise with the company back in 2012). After that year the ship started doing cruises to Cuba. The Crystal is larger than the Odyssey, able to accommodate 1,200 passengers to Odyssey’s 836, and has 80 more cabins. The ship has four dining areas, Amalthia Restaurant for lunch and dinner, Leda Dining Area for buffet lunch and casual dining, Aura Dining area for afternoon tea and Chef’s Corner at the pool area. For bars and lounges, there is the Helios Bar, Thalassa Bar, Eros Lounge, Horizons Lounge and Muses Lounge. In addition there is the Sana Spa and Wellness Center, Casino Fiesta and Duty Free shops. At 6:30 pm we arrive in Syros for a guided tour through Ermoupoli, the capital city of Cyclades Island and an a UNESCO World Heritage Site. Ermoupoli means “city of Hermes” (son of Zeus and god of commerce and travelers – shame on me, my first thought was about fashion). After visiting so many villages, Ermoupoli feels more like a small city, with an active Miaoulis Square, museums and neoclassical mansions. We traveled up to the domed Anastasi Church that has breathtaking views of Tinos and Mykonos. Then we traveled to the small beach village of Kini where we have dinner at Allou Yialou Restaurant. After dinner we returned to the Crystal and sail for Cesme, Turkey. We started the day with a relaxing morning at Sole & Mare Beach Club on Aya Yorgi Bay. The club rests on the pristine sand of Sole Mare Beach. Plush sun beds overlook sparkling turquoise waters. It’s a popular spot, but fortunately we arrived early. Then we were off to Alacati for lunch, a resort that is popular with the elite of Izmir. The next morning we are back in Greece and travel to Kos Island, the island of Hippocrates. We visited a family run winery at the foot of Mt. 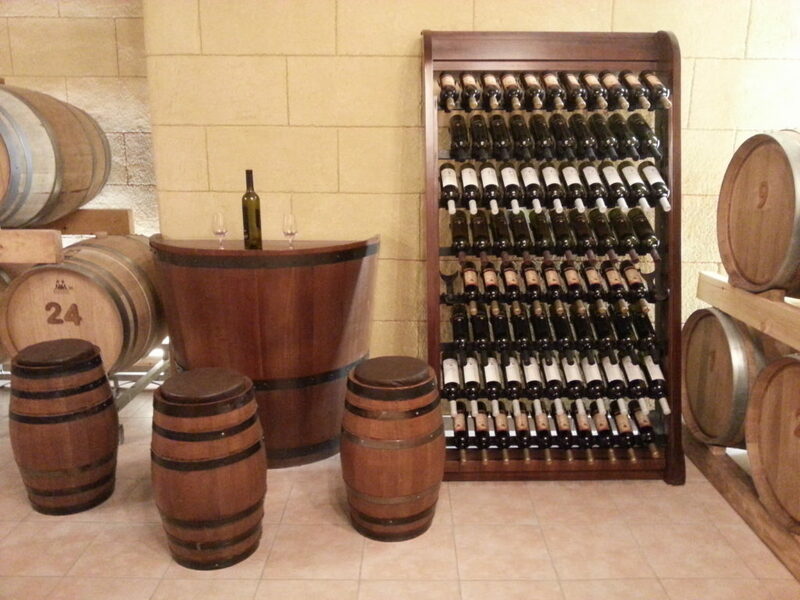 Dikeos for a tasting of local wines. Our next stop is to Kefalos to visit another family, this time of beekeepers, to see how fresh honey is produced and get a taste of thyme honey, loukoumades (mini honey donuts) and raki (a drink popular in Greece and Turkey) flavored with honey. Next we are off to the mountain village of Zia. Colorful houses have beautiful, bright flowers lining white stone steps, restaurants have tables and chairs in vivid shades of blue, green, orange and yellow. A rather steep and treacherous climb (due to the wind) up to a small white church provided panoramic views of Kos Island. Lunch was at a local tavern located on Marcos Beach back in Kefalos, on another scenic beach with waters dotted with rock formations. 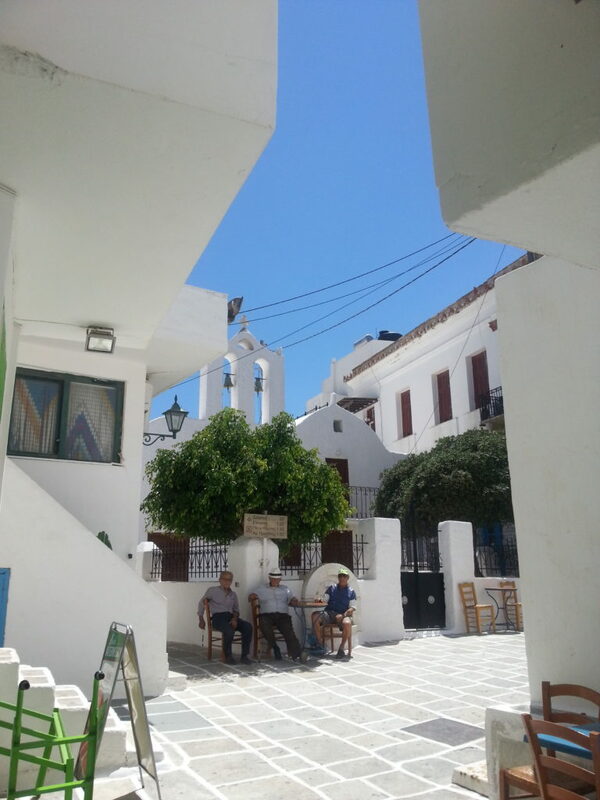 We arrive in Ios the following morning we visit Skarkos, an excavation site of a prehistoric settlement from the early Cycladic period, Manganari Beach, and then Chora, a Cycladic village, with white buildings and stairs and narrow paths, that is inaccessible to cars. In the afternoon we were back in Santorini and were taken to the ancient village of Akrotiri, often called the “Minoan Pompeii.” Then we went to Santos winery for a tasting of local wines. 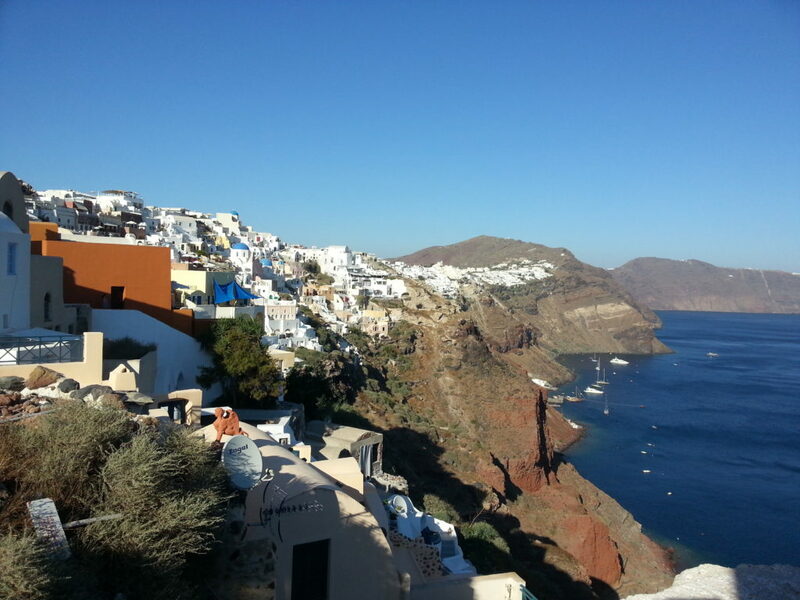 After enjoying the sunset, we returned to Fira, to roam the village and shop. In the morning, the Crystal docked at the Piraeus port and the cruise is over. Our last day is spent in Athens with a visit to the Parthenon (which I didn’t see on my first cruise, so I was thrilled) and the New Acropolis Museum where we had lunch, followed by free time in Athens. It was the middle of the financial crisis, so of course I had to do my best to buy as much merchandise as possible (and a new suitcase to carry it in) to help the economy. (At least that’s what I told myself each time I took out my credit card.) Our final dinner was at Varoulko Seaside, a restaurant on the harbor, with gorgeous views of the sea and mountains and fabulous Greek cuisine. For more information about Celestyal Cruises visit celestyalcruises.com. To stay in Athens, Athens Intercontinental (http://www.ihg.com/intercontinental/hotels/gb/en/athens/athha/hoteldetail).